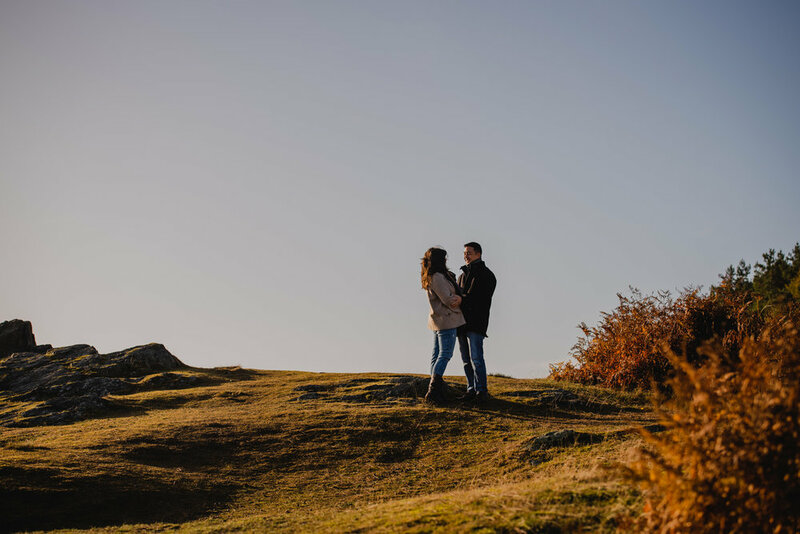 I joined Anna + Kingman in Bradgate Park for their relaxed couples shoot one sunny morning in November. I met this lovely couple for the first time back in September 2015 whilst photographing their good friends, Gina & Tom's wedding. We hit if off on the day and then I had the joy of also photographing their wedding in August. I absolutely love spending time with these two, we had a lot of fun together on their wedding day and their couples shoot was no different. They picked the gorgeous Bradgate Park in Leicestershire. I've visited the park before with Mr C which was lovely in the summer, but to see it in Autumn was something else. The landscape was absolutely bursting with burnt oranges and firey yellows. The landscape of the park really is breathtaking with so much to see, rolling hills, woodland exposed rock forms and even ruins. We met early in the morning, while the sun was low and the park was pretty much empty. I was a little worried I couldn't do the park justice, but I think I may just have managed to capture just a glimpse of all its glorious forms. We strolled, even hiked at times round the park taking in the views just having a proper lovely time. From exchanging memories of old Zelda games, to house renovations we could have talked for hours. I love my couples and when my couples become people I consider friends it really does makes me warm and fuzzy. “We decided to go to Bradgate Park in Leicester, one of our favourite walking spots. We know this place quite well as we've been coming here for years but Clare took everything to a new level for us. The photos she took was like looking at the park with a new set of eyes for us. The compositions were amazing, the colours and balance were great, and the whole process just felt so natural. If you're interested in your own relaxed couples shoot in Nottingham, Leicester, Lincolnshire or Derbyshire - get in touch!